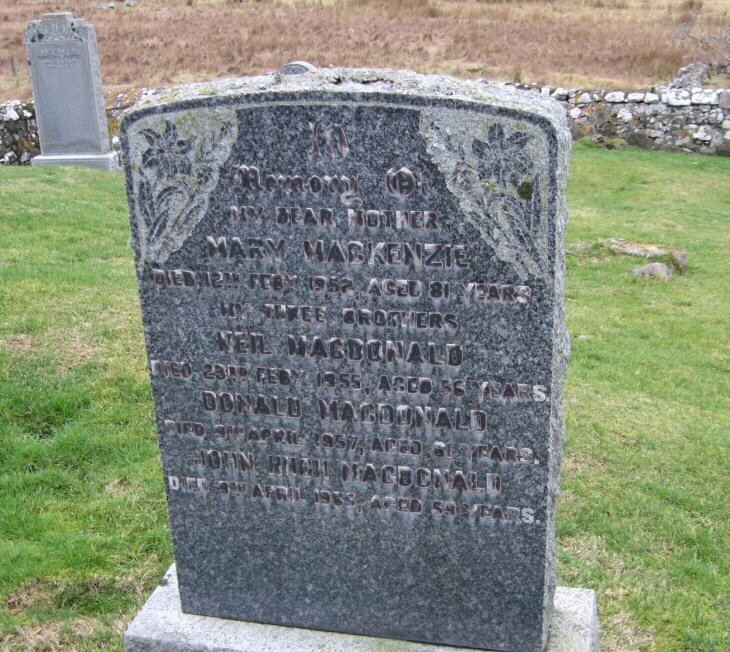 Skye Gravestones | Mary (Mackenzie) Macdonald & sons. Mary (Mackenzie) Macdonald & sons. In/memory of/our dear mother/MARY MACKENZIE/died 12th Feby 1952 aged 81 years/my three brothers/NEIL MACDONALD/died 23rd Feby 1955 aged 56 years/DONALD MACDONALD/died 9th April 1957 aged 61 years/JOHN KING MACDONALD/died 9th April 1965, aged 59 years. Picture Added on 22 January 2014.